Ford sold 9,400 units of the Ka in May. MUNICH -- Ford of Europe's new-car sales fell 16.3 percent in May, but the carmaker said newly launched scrappage schemes in the U.K. and Spain helped to limit the decline. Sales in Ford's 51 European markets including Russia and Turkey fell by 27,000 to 138,500 last month compared with May 2008. Ingvar Sviggum, Ford of Europe's head of marketing, sales and service, said: "We are already seeing promising signs that the scrappage bonuses introduced in Spain and the U.K. in mid-May are beginning to gain traction." He added that the market is still weak, so it was “very important that the scrappage schemes introduced by some countries are continued to support market demand and reduce overall fleet CO2 emissions." The U.K. and Spain are the latest European countries to offer new-car buyers cash incentives to trade in old cars for newer models. The U.K. remained Ford's No. 2 global market despite sales falling by 8,200 to 26,200. Ford said the British government's scrappage scheme added 3,800 registrations to May's sales figures. In Germany, Ford had its highest sales since May 2001 as the German government's four-month old scrappage scheme continued to attract buyers into car showrooms. Ford's German sales were up by 26.9 percent to 29,100 last month. Ford also performed well in Italy where it is the country's leading import brand with sales increasing by 23.4 percent or 3,800 units. Ford's sales in Western Europe's other major markets -- Spain and France - were down in May. In the first five months, Ford's European sales fell 17.9 percent to 680,500, hit by steep drops in major markets such as the U.K., Spain and Russia. But sales rose in Germany and Italy. Ford said its market share increased by 0.2 percentage points in May to 8.9 percent across its main 19 markets, the fifth successive monthly increase. 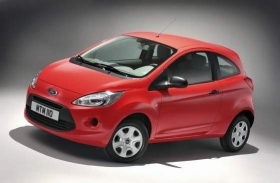 The carmaker's new Fiesta small car and Ka minicar are benefiting from scrappage incentives. The Fiesta is Ford of Europe's best-selling vehicle with 39,200 new models sold in May and more than 252,000 units sold in Europe since the car was first launched last autumn. The Ka, which was launched earlier this year, sold 9,400 units in May and 41,400 units year-to-date.